Rome traffic: Are we having fun yet? am a law-abiding citizen. Or I was. That was before living in a country where rules are only suggestions, laws are flexible, and the state has no money for toilet paper. This is not a standard criminal defense, but Italy will in fact make you do things you know are wrong just to survive. 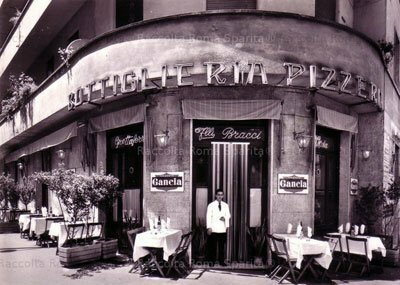 Italy can make you want to evade taxes because you get little to nothing for the 53 percent you hand over to Uncle, um, Salvatore. Italy can make you want to hitch a ride on a bus without buying a ticket because at least 30 other passengers are probably doing the same. Italy can make you want to drive without a legal driver’s license because you’ve been pressed into hauling your children across town to a private school. Why are they no longer in public school? Because it lacks libraries, computers and many other resources young children might need in order to learn and thrive. That includes the toilet paper. Note: I pay my taxes and always purchase bus tickets. In short, the state of the Italian state has driven me to abandon public education and drive illegally. Initially, this unauthorized usage of a vehicle — a Volvo station wagon — made me feel like a renegade soccer mom. I felt tough, edgy and empowered by my criminal status. I had street cred. Maybe I didn’t have an Italian license but I had two others, an American one and the Beastie Boys 1986 classic “License to Ill.” I’d be fine by channeling the spirit of Adam Horowitz (not to mention Freddie Mercury, Jeff Buckley, John Lennon, Tupac and Biggie). Until my husband said I wouldn’t. “You have to do it!” he wailed in his thick accent. “For the insurance. Because maybe they don’t pay if you make an accident, eh?” He glared at me the way my dad had when he taught me to drive. “Was that a question or a statement?” I asked him, dreading the answer. Let me just say this: any idiot can have a baby but getting an Italian driver’s license requires genius. The U.S. has no EU-style deal with Italy. Americans have to start from scratch, as in go to driving school, take the test, get a learner’s permit, and take the road test. I tried approaching the problem like an Italian. After all, I’ve been here nearly a decade. I asked around to see if anyone knew a driving school that could help me out — and by “help” I meant bypass the exam. I was in luck. My law-abiding and tax-paying neighbor (oh yes, a former GM executive) came through with what Romans call a racommandazione, which literally translates as “recommendation” but means so much more. When we walked into the driving school and my neighbor dropped the name Massimiliano, as in “Massimiliano sent us,” everybody straightened up, smiled and even winked. I was in like Flynn. The first thing the instructor told me was that I’d have to attend classes that began every afternoon at 5:15. The first thing I told him was that I couldn’t. “I drive a long way to pick up my kids everyday, so…” and I let my voice trail off. Excellent response. He seemed so much better than the drunken driving instructor I had in the U.S. when I was 16. “Here,” he told me, “this what you must study,” and he handed me a telephone book-sized manual. 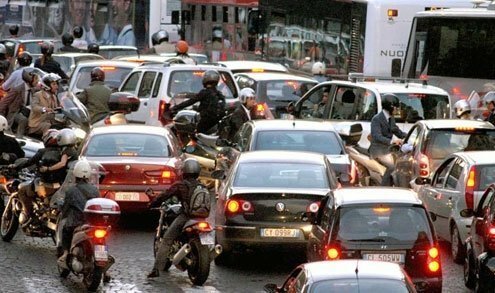 The idea that there were rules seemed a little strange since Rome is the capital of vehicular anarchy. I came by. He winked. I never saw a doctor. I loved this driving school! When the day came for the test, I was ready. Or ready for Massimiliano, my higher power at the DMV, to intervene on my behalf. I pulled up to the school to find the instructor in his car. He was ready to take me to the actual DMV. So I followed the guy. We pulled up, he introduced me to the exam proctor, showed me the room, and sat me behind a very good student — in case I needed help. This gave me pause. Why would I need to cheat if my fix-it pal Massimiliano was waiting in the wings? I started to get nervous. “I am not hopeful,” I told the nameless instructor. He smiled and said, “Oh I have a good feeling about today.” Then he winked. I never saw him again. I went inside, took the exam, and failed the exam.